Last week was brutal for the U.S. media industry, with employers laying off about 1,000 journalists, according to CNN. First, Poynter announced a massive layoff by media giant Gannett. Then BuzzFeed announced plans to lay off 15% of its workforce, and HuffPost followed suit. While these layoffs weren’t totally unexpected, they’re still a huge hit to an already struggling industry. 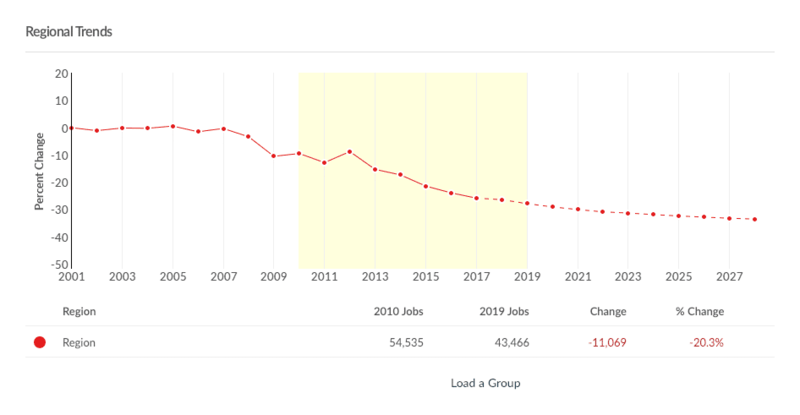 In fact, from 2010 to the present, the number of jobs for reporters and correspondents (the closest government SOC code to journalists) has dropped 20%. And it’s projected to continue dropping, but not as dramatically. Some of the now-unemployed reporters had worked in their field, and even on the same beat, for decades. And there are thousands of journalism students hoping to find work after graduation. The good news is journalists have valuable skillsets that translate to other fields, like public relations, marketing, human resources, etc. For example, I earned my degree in journalism and worked as a reporter and editor at a local newspaper before transitioning to marketing (the dark side, I know). But enough about me. Let’s look at the data! 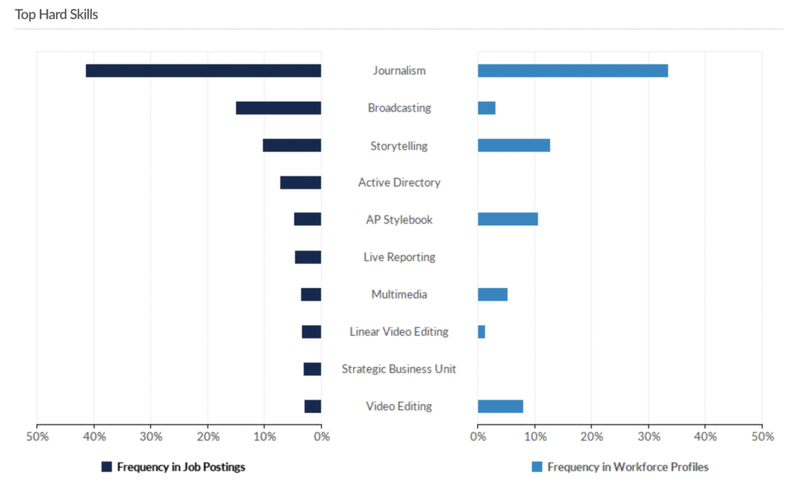 To find out exactly which skills are currently associated with journalism, I turned to Emsi’s job postings data and searched for any job postings for reporters and correspondents. In the graphics below, we can see the top 10 hard skills and top 10 common skills. The dark blue bars indicate employer demand for these skills—pulled from job postings. The light blue bars indicate employee supply—pulled from professional and social profiles. As you can see, many of these skills, like storytelling, video editing, writing, and communications, are needed in other industries. Especially the softer, more “human” skills. For example, in our recent report, “Robot-Ready:Human Skills for the Future of Work,” we found that human skills like communication, management, and leadership are in high demand across the entire labor market. 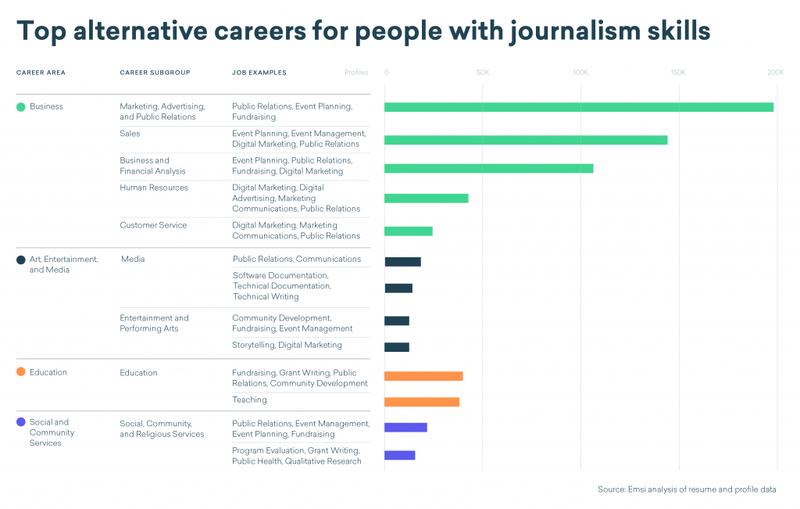 Now that we’ve looked at the skills, let’s look at the most compatible career options for journalists. To do this, we analyzed 1.5 million professional and social profiles and resumes to find the top careers for people with communication, writing, and journalism skills. While they work in a variety of industries, people with journalism skills, unsurprisingly, gravitate to public relations and marketing roles. In the graphic below, we can see the top four alternative career areas—along with subgroups and job examples for each. Business is the most compatible alternative career path for people with journalism skills. In all of the career subgroups within business, we see an overlap of PR, event planning, fundraising, digital marketing and advertising, and marketing communications roles. Whether it’s selling products, writing ads, developing a marketing plan, serving customers, or recruiting new employees, every single one of these jobs requires strong communicators. We see two major subgroups in the arts, entertainment, and media career area. First, in media, we see a mix of general and tech-related communication roles. Then, in entertainment and performing arts, we see that skills translate into things like community development, fundraising, event management, communication, and digital marketing. All of my journalism, broadcasting, and PR professors worked extensively in the industry before becoming teachers. They had real-world experience to share with students. So, I’m encouraged to see education as one of the top career alternatives for journalists. One of the best ways to ensure a future for journalism is to get top-tier ex-journalists in the classroom to pass on their knowledge. In this world of secondary and post-secondary education, journalism-related skillsets show up in teaching positions, grant writing, fundraising, PR, and community development. Turns out, a lot of journalists end up in community or national nonprofits that focus on a variety of issues—like our parent company, Strada Education Network, for example. Here, we see that a journalist’s skillset translates to PR roles, event management and planning, fundraising, program evaluation, grant writing, public health, and research. The continued layoffs of journalists, at both national and local publications, are a huge loss. And I certainly don’t want to minimize that. But the good news (pun intended) is if you can communicate well, you can do just about anything. Writing, communicating, research, storytelling, management, etc. have universal appeal outside the newsroom. Meredith Metsker is a data journalist at Emsi. Contact her at meredith.metsker@economicmodeling.com.